← This time last year, we almost had the key to the store . 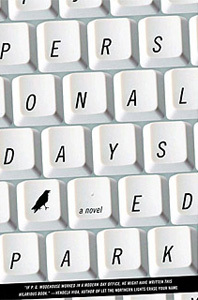 . .
At our 7th event of our Birthday Fund Drive tonight, Personal Days, Desperate Nights, Ed Park, Jon Michaud, S. J. Rozan, and S. A. Solomon will be reading, and Uptown Collective editor in chief Led Black will be introducing the readers and moderating any talking afterward. How did this reading come about? In some ways this started with the Led Black–Jon Michaud connection. 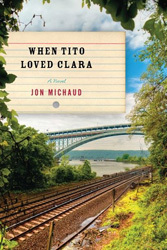 Jon Michaud’s novel, When Tito Loved Clara, is set in Inwood, so of course avid reader Led pounced on it, loved it, then made it the inaugural title in the Led Black Book Club. At one of the first meetings about Word Up, the writer of this blog post obtained a copy from Led. Besides screaming PAYSON! every time that beautiful little Inwood street was mentioned in the book, she couldn’t put the damn thing down. But then, what next? There are shadowed corners of Inwood Hill Park that show themselves in When Tito Loved Clara, so that made us think of other shadowed corners of areas close by. Enter Akashic Books, the indie publisher with a large community-minded heart—whose tagline for Pete’s sake is “the reverse-gentrification of the literary world”—with their popular place-based Noir series, and soon we had S. J. Rozan, editor of Bronx Noir, and S. A. Solomon, contributor to New Jersey Noir, on the bill too. For Manhattanites who think those places are far away: the Bronx and Jersey are hardly more than 10 (traffic-free) minutes from any point uptown. To round out tonight’s reading bill, we are honored to have Ed Park, author of the office romper Personal Days and its cousinly (but no longer) weekly newsletter The New-York Ghost, not to mention editor of a million things we like a lot. Ed doesn’t live all the way uptown but he has a secretly special place at Word Up all the same. Years ago, Ed was looking for a book for his dad, shopping at his local independent bookstore, and took a chance on an independently published book he thought looked interesting and had never heard of before. Turns out he liked it, wrote about it, and soon an indie publishing project (born in the Bronx and the Heights) that was facing a heartbreak future became a thing. A low-key thing, an under-the-radar thing. A thing that enjoyed the independent spirit in authors, publishers, bookstores, and heartily appreciated every time someone spent a moment with a book, or some form of bound and printed words, and decided to take a chance. It’s that final act of committing that can push an idea to the next level. And as this happens incrementally, over and over . . . you eventually get to a place where you’re co-supporting a 1000-square-foot bookshop and art space on Broadway full of unusual locally crafted and drafted items that are waiting for chances to be taken. You get Word Up! And all the other things in our neighborhoods that have the spirit of Word Up, whether you are uptown, or in the Bronx, or in Jersey. But, of course, we would be remiss not to reiterate that act of commitment. And because it’s our Birthday Fund Drive, we shall link back to where you too can make a commitment! INTERMISSION: Another thing we would be remiss not to mention is that we are all here, reading or writing about this Birthday Fund Drive, because 1) we already know we like books and bookstores, and 2) we have the internet. This is not something that is a given. If you have grown up in a neighborhood without a bookstore, or with very few, and with few and crowded public library branches relative to the concentrated population of your neighborhood, how are you going to know if you like books? Word Up regularly sees teachers come by to buy books for their school libraries that are either understocked or in some kind of temporary holding and inaccessible to students. This happens. It doesn’t happen in all neighborhoods, but it does in some, and it’s in those neighborhoods that it’s important to have something as simple as books—and readers—visible on a regular basis. This is where Word Up comes in. This is why we are asking you to help us stay. And, the night continues! A special event we are having at Word Up following the Ed, Jon, S. J., and S. A. reading is another installment of inQbator, the monthly Queer literature and cultures program in Washington Heights. inQbator is celebrating Pride Month with tonight’s program Color Me Queer, which will include the works of local Latina poet Yoseli Castillo Fuertes presenting her recent book of poetry De eso sí se habla / Of That, I Speak, the multimedia readings and presentation of Brooklyn based artist Michael Newtown, and the performance art piece, “Besame, Besame Mucho” by Hector Canonge, director of the film series CINEMAROSA. inQbator will be at 9:30pm tonight. This entry was posted in Uncategorized and tagged books, bookshop, bookstore, childrens, community, dominican, english, espanol, events, fiction, inwood, neighborhood, new york, new york city, newyork, newyorkcity, nyc, russian, sale, spanish, uptown, used books, washington heights, word up, word up books, wordup, wordupbooks. Bookmark the permalink.